All of us know that there is only ONE clipboard. WRONG! 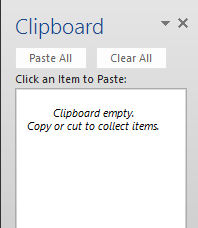 There are actually 24 clipboards if you use Word, Excel or PowerPoint. When you copy something, whatever was already there in the clipboard gets overwritten. If you want to change that behavior you must activate these 24 clipboards. It is simpler than you think. Just click on that unseen, unnoticed yet extremely powerful arrow at the corner. Technically these guys are called Dialog Launchers. Why? Because these activate the dialog related to the name written next to it. Just click on it and a new pane (docked window) will open on the left side of the application. This shows the clipboard contents. If the clipboard has something in it, it will be shown. If not, the pane will be empty. Now onwards, whenever you copy something, it will accumulate – it will NOT overwrite the existing clipboard. Whenever you copy, notice what happens at the bottom right side of the screen – it shows you a small popup which counts how many clipboards are colledted (1 of 24, 7 of 24 and so on). Some kind of copying cannot be added to the clipboard – like copying files. In that case the popup will indicate the problem. There are a few options. I will discuss these options in the next articles. But why don’t you figure it out yourself, in the mean time. I will also show you practical usage scenarios of this powerful feature. Before you ask, it has been there for many years. It is just that nobody noticed it – like thousands of others! 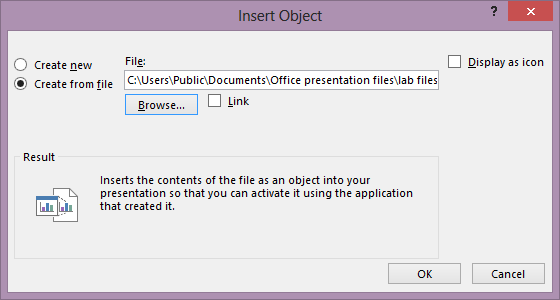 In the last post, we saw how to use PowerPoint Actions to open a linked or embedded file during the presentation. Although this method works with inserted objects as well, there is a practical problem there. In fact there is a psychological problem. Insert Object is used in two situations. This is usually done when you are going to send or upload the presentation for others to view it offline. You insert the related files as objects on relevant slides. In this case, others are supposed to see the icon so that they can double click on it to open the file (in edit mode) or add an Action for opening it during presentation mode. There is no problem in this scenario. Inserted Object is shown as an icon. You use it when you DON’T want to show any data from your Excel file upfront. You just want to describe the situation. And in case someone asks for details, you want to be prepared. That is why you have done Insert Object and add the Open Action. In this case, you know that you have access to the detailed data. But the problem is that, the audience can also see the file icon. If they see it, they will naturally ask you what it is. This is not desirable. Why not? Because opening the file may lead the presentation on an unwanted tangent. Therefore, you want to have the ability to open the file on demand (if you are in trouble) but you don’t want others to view the icon to arouse their unwanted curiosity. These are paradoxical requirements. How do you manage this? NO problem. Little bit of ingenuity will help you here. When you add the object, don’t show it on the slide. Just take it beyond any of the corners of the slide. Nobody can now see that you have a file inserted. But you know that it is there. Anytime you want to open the file, you just have to go to that corner blindly… make sure the cursor has changed to the hand icon and click…. voila …. the file opens! That is best of both worlds! Although Office is a technology, its usage is driven by psychology. When you are presenting, you want to be in control. You should think like the audience would and then take corrective action. If people see something, they can ask you questions about it. If they cannot see it, you are better off. In fact, the art of presenting effectively is all about understand how audience will react and then tweak your presentation to get the desired response and influence the audience. Of course, I am not suggesting that you use it in an unethical or illegal way. But all said and done for every presentation there is an objective. Selling, Teaching, Convincing and so on. It is your job to align the audience with your objective. That is psychology! Next article – How about 24 clipboards? We always had ONE clipboard. You copy something, it does into the clipboard. 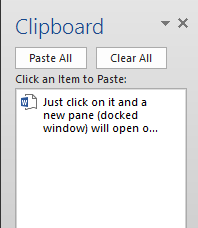 The original clipboard is overwritten every time you copy. But that is not the case. We will explore it in the next article. 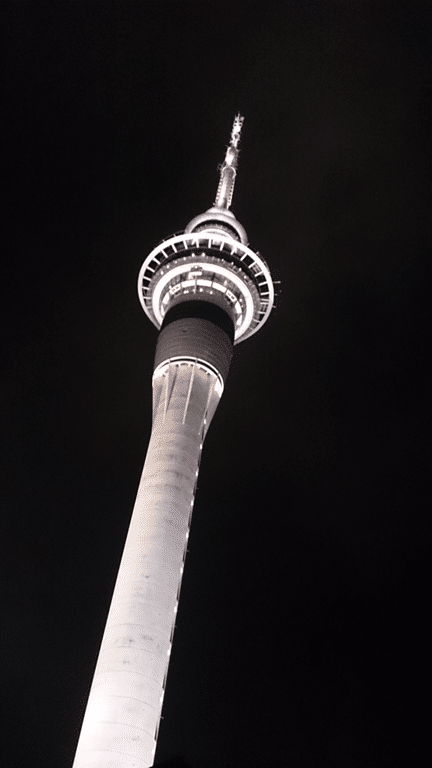 Writing this blog sitting under this beautiful Auckland Sky Tower… Lovely weather. You have to now open the original Excel file which contains the raw data. We want to avoid such trouble during a presentation. Therefore, we try to solve the problem by trying to copy pasting the raw data into PowerPoint. Unfortunately, large amount of data cannot fit into the limited space available on the slide. When you suspect that someone may question you on your summary data, you need to be prepared. How do you do that? You already know. First step is to get the context of the original file into the slide. 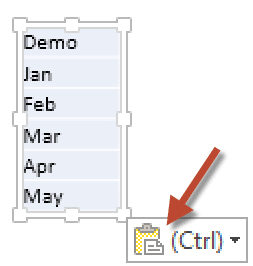 In either case, WHILE EDITING the presentation, you can write click on the pasted object and open the Excel file. What we really want is to have the same ability DURING THE PRESENTATION. To understand how it is done, we need a small detour. I will cover this in detail in another article. But here is the shorter version. A presentation contains slides. Each slide has various shapes and objects on it. When you run the presentation – PowerPoint shows the first slide and waits. When you click it goes to next slide … again waits … then you click – next slide … and so on till you end the presentation. Is this a problem in word as well? The CLICK is called the TRIGGER and MOVING TO NEXT SLIDE is the ACTION. In our case when we click on the slide containing the summary data, it simply goes to the next slide. If you right click, the menu now shows presentation related controls. The open worksheet command is missing. 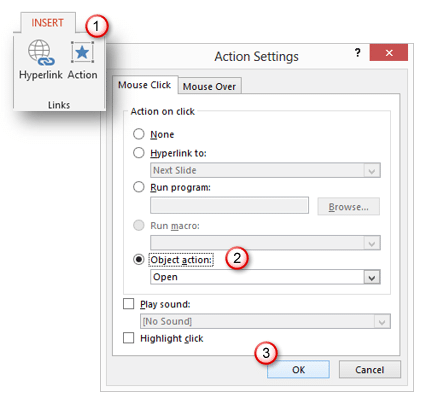 This is the time we change the default behavior of PowerPoint and ask it perform a DIFFERENT ACTION when we click on the Summary object. How to do that? Now run the presentation and see what happens. 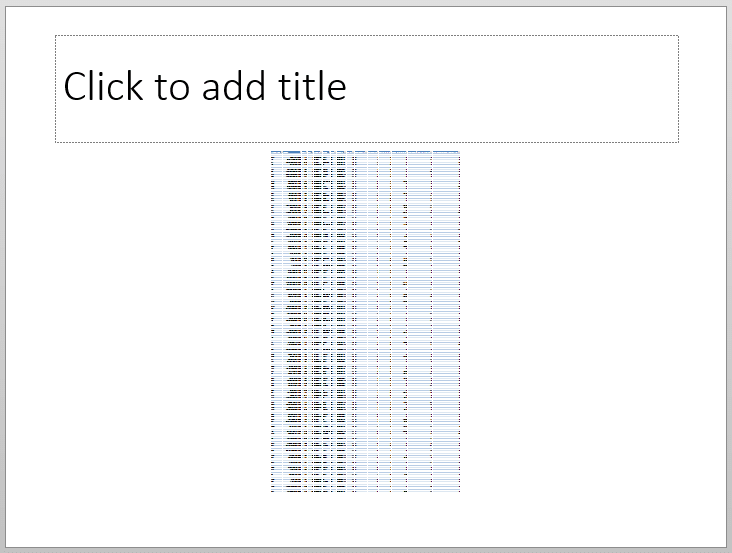 On this slide, if you click anywhere outside the Excel data, it will just go the new slide as expected. However when you move the mouse cursor over the Excel data, the cursor shape changes to indicate that it is a hyperlink. Click on it to open the Excel file. Show the details and then press ALT TAB to come back to the presentation. It is still running undisturbed. Although this method works with inserted objects, there is a practical problem there. In fact there is a psychological problem. Inserted Object is shown as an icon. Therefore, your audience knows that you have a collateral file. So even if they have no reason to trouble you, they may just ask you to show the file. You don’t want that to happen. Why ask for unnecessary trouble? We will handle that interesting situation in the next article. Please read the Intro post and the Embedding post before reading this article. Insert Object embeds an existing file or new file into your document. In that sense it is like Embedding – which we discussed in the previous post. So what is the difference? The starting point is different. In case of Embedding we first open the source document, highlight some portion of it and then paste it into destination while choosing EMBED option. In case of Insert Object, we first go to the destination and then choose the ENTIRE FILE to be embedded. Therefore, we do not get any control over which part of the inserted file will be shown after it is added to the destination. If you choose an existing Excel file and Insert it into PowerPoint it tries to show the contents of the Excel file in PowerPoint. Excel file can contain many worksheets. Which worksheet to show? PowerPoint does not know that because we never mentioned that – we just selected the file to insert. Therefore, PowerPoint shows you the contents of the sheet which was active when the Excel file was closed the last time. If this sheet happens to have large amount of data, the Insert Object command may take a very long time to complete and the results will be very deplorable. Now the Inserted file looks like this. It is a good idea to change that default description to something more business context specific. Click on change icon and change the title. Also note that there are many icons available. Choose the one which suits the content type. File size does increase as much as the original size of the file. While embedding files, make sure you are choosing the new file formats. If you embed older formats (XLS, PPT, DOC), the file size will be much larger. Note that you can use any file in the Insert Object dialog. It need not be Office document. It could be any type of document. The default size of the icon is very small. 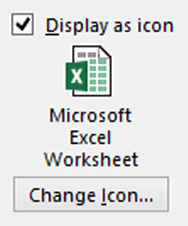 If required, you must manually increase the size of the icon to make it visible during the presentation. Remember, if you make the icon visible enough, you are also taking a risk. Anyone from audience may ask you to show the contents of the file and then you must do so. Do you want an easier solution? Now that we know Paste Link, Embed and Insert Object, there is an easy solution. If you think you may have to show details during the presentation, use one of these approaches to make sure that you have the file either linked or embedded. Now the question is – how to tell PowerPoint to open the file – ON DEMAND? That is what we will discuss in the next article. In the previous post, we saw how linking of files works. Now let us understand what Embedding means. 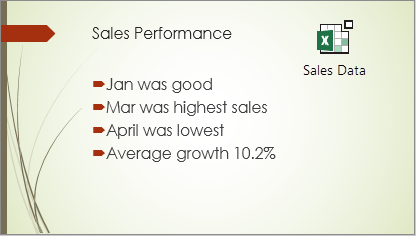 We will continue with the same scenario of embedding an Excel File in PowerPoint. However, this concept would work across all Office applications. You have copied some data from Excel. 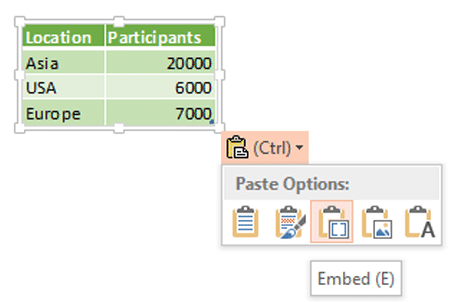 Now you paste it into PowerPoint and choose the EMBED option. It is still showing the Excel range you copied. It behaves like a picture if you try to resize it. But it actually made a copy of the ENTIRE EXCEL FILE and stuffed it into your PowerPoint presentation. If the original Excel file was, say, 20 MB in size, the presentation size will also grow by 20 MB. If you want to package the Excel file with PowerPoint presentation, then this is the best option. The benefit is, you can still show specific summary data on the slide. If you want to send the presentation with collaterals – this is the best way. How to open the embedded file? 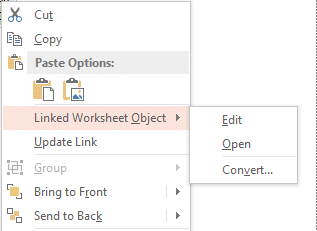 While editing the presentation, just right click on the object – Choose Worksheet Object and Select Open. DO NOT choose EDIT. If you do, it tries to give you Excel editing capabilities in the small area in which you have pasted the data. 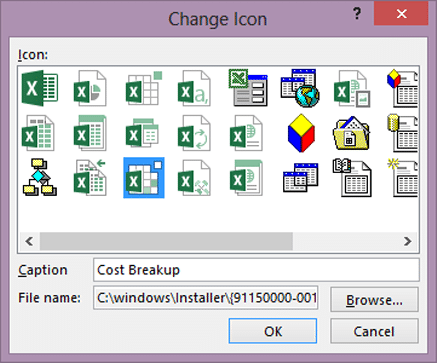 The ribbon automatically changes to Excel options rather than PowerPoint options. This is called in-place editing. But most people get confused with it. If you want to expand the range of selection, this is a good option to use. In either case, the Excel file which it opens is NOT the original file. It will have a name like worksheet in Presentation3. This file now lives inside the presentation (in geek language, it is called OLE File System). For any reason, if you feel that you should not have embedded the file, how to manage the situation? I am sure you will know this answer if you have read all the Copy Paste Series posts. Copy the Embedded object, Paste it as Picture and delete the original embedded object! We will explore the Insert Object feature in the next post. It is similar to Embed but with a small difference. In fact Insert Object and Embed are interchangeable! Paste Link and Embedding are extremely useful. But most of us have not fully understood it. I am going to split this post in to multiple parts because I want to keep individual post short. Let me list down common requirements. 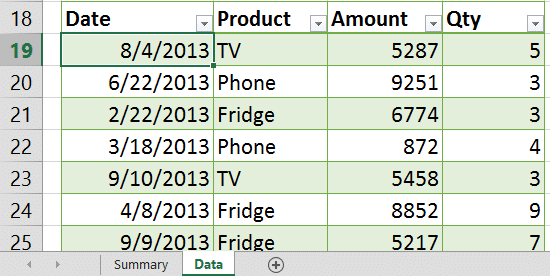 Just attach an Excel file to a presentation as a collateral – without showing any content from it. These three requirements translate into three different methods of Copy Pasting from Excel to PowerPoint. Paste Link, Paste Embed and Insert Object. All these Copy Paste methods work between all Office products. Excel to PowerPoint is just an example scenario. We often have summarized version of data in a worksheet. For example, you are showing YTD results (cumulative) across the year. The data is updated every month. 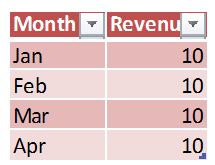 You need to copy paste the current month status into PowerPoint for monthly review presentation. 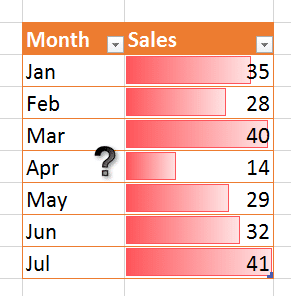 Every month you copy paste SAME range in the SAME worksheet in the SAME Excel file. In this case you can save yourself the trouble by linking the Excel data to PowerPoint. 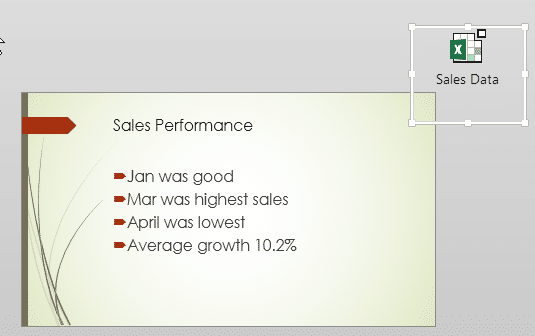 Thereafter, PowerPoint will keep the data updated automatically. Come back to the presentation. Notice that the changes are automatically shown. Changes to data as well as formatting are automatically reflected. In the above example, both files were open at the same time. However, in real life, you will usually edit the Excel data across the month and at that point of time, you presentation is not going to be open. Similarly, when you open the presentation to prepare for the end of the month review, the Excel file is unlikely to be open. But you don’t have to worry. 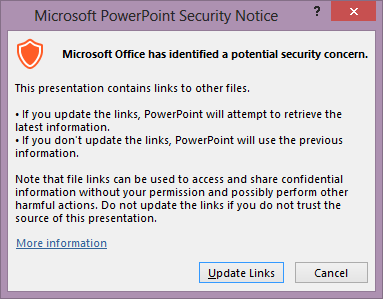 The PowerPoint presentation remembers that there is a link and it manages that link for you. Whenever you open the presentation, it will ask you if you want to update the link. If you choose Continue, it will find the Excel file and open it (behind the scenes) and update the data. This dialog may look a little different depending upon your settings and version of Office. 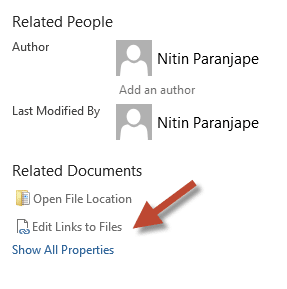 In the File – Info page of PowerPoint, you can view and edit the links. Links are not good for others – break them! Who benefits from the linking? You – the creator. If you send this file to some other person, they don’t really need this automated linkage. They are unlikely to have access to your original Excel file. When they open the file, the update dialog will still appear – confusing them unnecessarily. Therefore, when you send the presentation to others, it is better to break the links. But wait! Don’t remove links from the original file. Make a copy first. Go to File – Info – Edit Links, Select the links and choose Break Link. Now the linked items just become pictures. Remember, linking a file does not increase the size of the presentation. 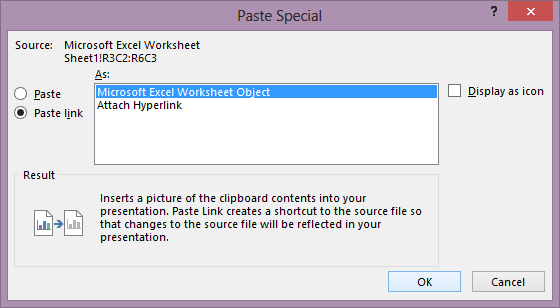 The PowerPoint file has information about the linked Excel file. But the Excel file has no clue that there is a presentation linked to it. Therefore, if you rename or move the Excel file, PowerPoint update may fail. If you know the new name or location of the file, you can choose it again and the link will be re-established. In the next article, we will see how to Embed a file. In the last post, we saw the video. It was a fast paced video. In this post, I will explain the same thing in a step by step manner – with some additional details. The objective is to copy from Excel, Paste it in PowerPoint, Edit it in PowerPoint and then display it properly (in adequately large size) on the slide. The concept is simple. Pasting data can be done in many formats. Table format allows editing, and Picture format allows easy resizing of the image. We have to use both these formats in this case. The data looks very small in PowerPoint and you cant edit it. Why so? Because in Excel we usually use a higher level of ZOOM and in PowerPoint we have a lower level of ZOOM. While copy pasting the ZOOM level is NOT copied. That is why it looks so small and unreadable. Now we need a picture. That is simple. Copy this edited table first. In case you want to edit the data again, you cannot use the picture. Delete the picture. The edited table is still available there. Edit it and repeat the process. Where to Paste ? and How to Paste? If you answer these questions correctly, Office will give you the desired results immediately. If you do not provide clear instructions while copy pasting, Office uses default behavior which may not be what you intended. In the next article we will see when to use Paste Link, Embed and Insert Object. If you have time, view the video in the previous post and tell me which method you prefer. Video (short and crisp) or step by step instructions (takes longer to read). Please read Part 1 and Part 2 before reading this post. 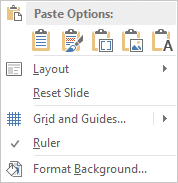 As we saw earlier, default paste from Excel to PowerPoint is a Table. 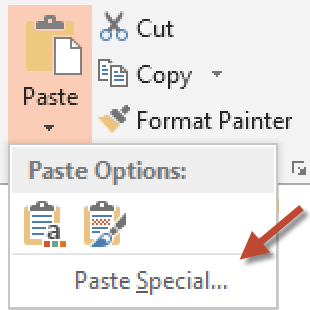 What if you want to edit the content after paste? Of course, Table can be edited but not resized easily. Here is the solution … view this 44 sec video. The video is very fast paced. But just remember the context. Then you will understand it easily. Rerun, pause and try it out if required. Was it too fast? Would you prefer slow video or step by step instructions as screenshots? Let me know your feedback. The next post will be step by step instructions with screenshots for this video. Try it out. If you find it useful, share it with the world. Please read the first part of this series before reading this one. 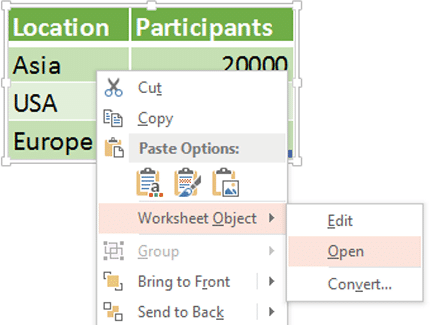 Copy pasting from Excel to Powerpoint a very common activity for business users. You can copy either data or Charts from Excel to PowerPoint. WHERE to paste and HOW to paste? In the previous post, we saw HOW to paste and choose the right format. Let us address the other question. WHERE to paste. 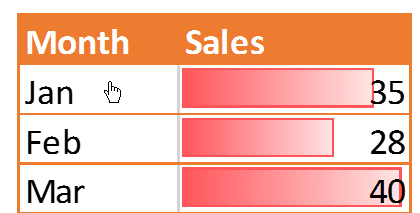 When you copy (data – not chart) from Excel and Paste it into PowerPoint, it creates a separate object in some cases. This is because we have not explicitly told PowerPoint where you want to paste it. That is easy to do. CLICK or better still – RIGHT CLICK in the textbox or object where you want it pasted. Please note that this approach does not work in case of Paste Link. The object will be pasted as a separate entity even if you click inside the text box. This is best done by looking at the ribbon tabs at the top. When you click any object, one of these toolbars will appear automatically. Noticing these is a very good idea – it is like Situational Awareness in Office! 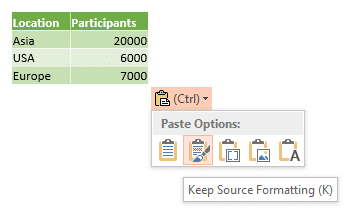 These are the paste options available for Excel data while pasting into PowerPoint. This is the default and usually nobody likes it because it applies local color theme which is black and white. Therefore, the source formatting is not shown here. The data is pasted as a TABLE. This is very important. This option uses local theme (colors as per PowerPoint template). It is still a table. So the data is editable. But the problem is that the pasted table looks too small. Trying to make it bigger is gives you a headache. What happened? The table became bigger – the grid increased in size. But the content font size did not increase. This is NORMAL behavior for any table. It is just that we expected it to resize nicely! If you want everything to resize correctly, then this is the WRONG format. Read on to find out what is right. Embed is a dangerous option. What does it do? It makes a copy of the ENTIRE Excel file and stuffs it inside the presentation. What you see is only the part you had copied. But the file size of your presentation will increase as much as the Excel file size. This is a good option to send the original Excel file as a Collateral along with the presentation. This is the option most people need. The data is converted to a Picture. Now you can resize it without distorting it. Remember to remove AutoFilter option before copying – otherwise the drop downs of filter will appear in the picture. Unfortunately, that means, you cannot select filtered data for copying. This option is the simplest one. It just gives the text. 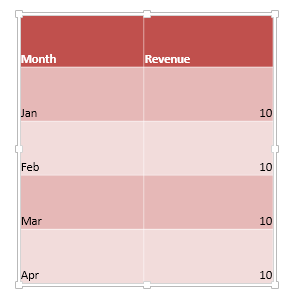 Notice that if you selected multiple columns of data, the text is separated by Tabs – not spaces. 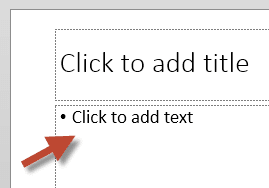 When you paste anything into PowerPoint – and it originated outside PowerPoint – it is pasted perfectly in the center of the text area. Unfortunately, we often need to resize the pasted object because the default paste was too small to be visible on a slide. I am sure all of us have found out the hard way that resizing an object without distorting its proportions is to drag from the corner – not from sides. The solution is to press key while dragging it from the corner. This way the center is not disturbed but the size is increased.